As you May know if you read this blog I bought a whole hog this year from Windsor Family Farms. Having so much pork may seem a little daunting but it is more than just chops, roasts and ribs. One thing is bacon! Rub the cure into the pork belly then place on rack in a large plastic bin. If you are doing more than one rack just stack them up. Place in the refridgerator for 2-5 days (depending how salty you like your bacon). Each day simply drain off any liquid. Once done take out of cure and wash off with clean water. Dry and then place back in refridgerator on a rack over night to dry. I took out half after too days and this made a delicious breakfast bacon. I left the rest I left in for a week and this is great for salty lardons in soups and salads. Once cured the bacon should be good for two weeks but keep it in the refridgerator below 40. You can also freeze for longer storage. 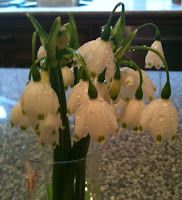 The following post isn't local to Cupertino but it highlights a general issue for a locavore. Sourcing local grain is very hard and I would interested to hear from anyone who has managed to do this in the bay area. Grain is one item that determined locavores often stumble over. Typically, it's just not widely available, if grown at all. 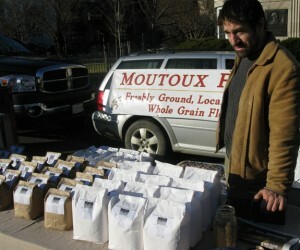 That's why we were glad back in December to report that Rob Moutoux, third generation of local farmers, was at the Dupont Circle farmers market selling several varieties of grain he was growing near the family farm in Loudon County. At the time, Rob had about 10 acres planted and was producing some 30,000 p0unds of grain he hoped to place in local stores. But now he has written customers and friends that he will no longer be offering his grain at farmers markets or in stores but only at the family farm stand near Purcellville. Consequently, he is also reducing the amount of acreage he is planting with grain and focusing more on the family's orchard business–for which they have been famous for years–and a CSA program. "There is certainly a business opportunity for local grains. It wasn't so much that the market wasn't there, though I didn't really tap into it very extensively in 2009, going to three farmer's markets," Rob said in a e-mail when I asked him to explain his decision. "When we spoke, I was looking at expanding markets through selling wholesale to local food coops and health food stores, and discontinuing the farmer's markets. I still think that's a great idea. The reason I'm not doing it is because it's just not a project I want to take on at this time. I've got my hands in a lot of different projects right now, and in order to do them right, something has to give. "I will say that there are several mills in PA that are on to this sort of project already, and have their organic flours in DC area stores (not sure which ones). It's true that grains are successful on economies of scale, and so these mills that can move, clean, store, and mill more efficiently than I could are much better suited to make a go of it. These would be Small Valley Milling, Frankferd Farms, Annville Mill, and maybe a few others." Perhaps some readers know of these brands and where they are being sold in the D.C. area and can share that information in the comment section. 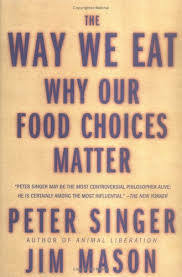 Just finished reading "The Way we Eat: Why our food choices matter" by Peter Singer and Jim Mason. This was a very thought provoking book for me. Unlike other works on industrialized food such as Food Inc, and Omnivores dilemma this book really focused on the ethical question and how they way we eat effects others. This book provides a very detailed account of the three families with quite different lifestyles and values. It examines the food choices they make and ethical and economical assumptions that drove those choices. They also pull apart the ethics of locavore's and fair trade in similar detail. Very interesting book which provides great information for ethical food choices and busts a number myths and plain lies around many of the stated ethical practices and badges we find today in our search for food. There is a strong, I felt too strong in places, bias towards Vegan-ism as the way to ethical nirvana. This made me want to defend my omnivorous ways, I find myself more in the Pollan/Fearnley-Whittingstall camp on the consumption of meat and the ethics of doing that, than Singer & Mason are but I respect their viewpoint. I would recommend this book as a good complementary resource to other more popular works out there, particularly if you are concerned about the effect of your food choices on others as well as yourself. The Snowdrops are in bloom in my garden and despite what the weather is really like this is a key indicator of the end of winter and my thoughts spring (no pun intended) to gardening tasks which set things up for the prime growing season. In truth this area is one of the few in the world that can support the growing of food crops year round but my garden is not really set up for this. Last year I managed to clear an area down the side yard of my house. Although this area is south facing, because of the proximity of the neighboring house I have to wait for the spring before I get enough light to give plants a fighting chance. The yard itself currently has two raised beds which are about 2.5 ft x 6ft and I hope to clear out a bit more ground this year to get two more similar raised beds installed. I grow a lot of plants in containers, well buckets would be a more accurate description (Home Depot sell 5 gallon buckets for about $2) but last year I was surprised by the success I had and the amount of food I was able to harvest out of such a small Plot. My point is, that you really don't need to have a lot of space just the right combination of plants and enough sun and water to make them grow. The only tricky part is knowing what to plant and when. I took a community class last run by the Master Gardeners of Santa Clara County and they gave me a wealth of information on what, when and how to garden in our area. You can find classes in the local paper or the community college pamphlets that come twice a year. Planning for this years planting started back at the beginning of the year when I sowed seeds for many of the summer cropping plants. My tomato, pepper and basil were started under a grow lamp and moved to a indoor windowsill once they had got a few full leaves. Growing plants from seeds is by far the cheapest way to go and with a bit of planning up front really isn't hard. 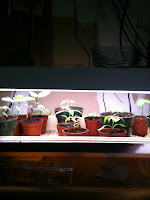 I simply sowed a few seeds in each pot then set them under the light. As the small shoots came up I thinned out each pot to one plant (just snipped the others off). 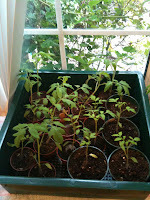 The tomato plants are already too big for the lamp box and were moved to a windowsill a couple of weeks ago they will be ready for planting out soon. The peppers and basil needed a little more time to develop but are catching up fast. I also planted some peas, beetroot, chives and chard outside in a little polythene tented propagator. These required less heat to germinate and so could be sown outside in pots. They are also doing well and will ready for transplant into the main garden quite soon. One new crop for this year is the potato. I decided that I missed the taste of freshly dug new potatoes just boiled in their skins and served with butter a traditional June treat in the UK. Growing them seemed the best way to get the freshest potato so I splashed out on some seed potatoes and they are currently sitting on the same windowsill as the tomato plants to enable them to sprout. A process in gardening parlance known as chitting. Potato is a great crop for growing in containers. Back home in the UK my father would grow them in garbage cans. 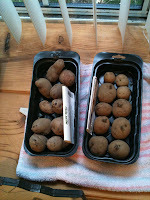 I have some deep sturdy bags that will do the job and hopefully by June will have a bumper crop of nice new potatoes. One thing about growing from seed is that you have to hedge your bets on yield and plant sow than you will eventually plant out. This might seem a waste but I can always find people who would like a few plants for their own and so I get to pass on my labors and let others benefit. I am planning a couple of other projects for the garden this year. Firstly I am planning to use one of my new beds to grow a "Three sisters garden" which is Native American method of planting Corn, beans and squash in a complementary manner which maximizes production in a small space. In a similar vein I am also planning a herbal garden once again influenced by Native American planting methods. In this case the garden is known as a medicine wheel and I will blog about both of these planting methods in later posts.